With the exception of sleep, humans spend more of their lifetimes on work than any other activity. It is central to our economy, society, and the family. It underpins our finances and our sense of meaning in life. Given the overriding importance of work, we need to recognize a profound transformation in the nature of work that is significantly altering lives: the incoming tidal wave of shadow work. 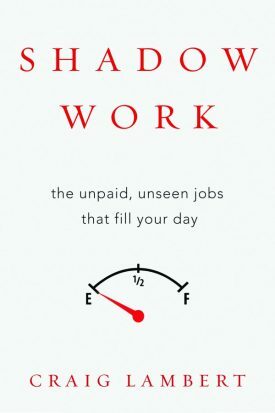 Fueled by the twin forces of technology and skyrocketing personnel costs, shadow work has taken a foothold in our society. Lambert terms its prevalence as “middle-class serfdom,” and examines its sources in the invasion of robotics, the democratization of expertise, and new demands on individuals at all levels of society. The end result? A more personalized form of consumption, a great social leveling (pedigrees don’t help with shadow work! ), and the weakening of communities as robotics reduce daily human interaction. Shadow Work offers a field guide to this new phenomenon. It shines a light on these trends now so prevalent in our daily lives and, more importantly, offers valuable insight into how to counter their effects. It will be essential reading to anyone seeking to understand how their day got so full — and how to deal with the ubiquitous shadow work that surrounds them. CRAIG LAMBERT is the author of Mind Over Water: Lessons on Life from the Art of Rowing. He is a former staff writer and editor at Harvard Magazine and has also written for Sports Illustrated and Town & Country. He graduated from Harvard College and received his Ph.D. in sociology, also from Harvard, in 1978.